Welcome to the Student Council Organization ‘SCO’! ISC Student Council Organization ‘SCO’ is your point of connection for the full spectrum of involvement at Our School. You can connect with leadership initiatives, engage with our student organizations, advance your learning, and create lasting memories. Experiences from across campus are promoted or housed within the Council to fully meet the needs of all students at beginning, intermediate, and advanced levels. The Council offers programs, resources, and services for individuals and student groups to help you take the next step in your membership, leadership, and citizenship. For students looking forward to getting involved, this is a great place to start! Set up a meeting with a staff member or catch up with friends in the Student Lounge. ISC Student Council Organization ‘SCO’ is a vital part of the ISC Educational System and a significant part of every School day. Emphasizing on the awareness of `life skills` through real-life practices, the Student Council Organization is a student-led community that empowers students to take charge of everyday Life while carefully considering the various opportunities for emotional, social, and moral growth. The SCO provides students with opportunities to learn through hands-on experience. The SCO helps students develop skills in leadership, decision making, communication, goal setting, fiscal management, marketing and promotion, organization, and time management. The SCO also supports students in advancing their academic, professional & managerial skills in a variety of academic and non-academic activities. These include peer tutoring, planning for activities and social events; organizing community service projects; and being involved in the school tabloid and school yearbook. Endorse high social, ethical, and moral values. Become dynamic and useful members of a society. Develop academic, professional, managerial, and leadership skills. Obtain and refine the attitudes that give them an edge in college and throughout life. Become involved in diverse student-led activities. 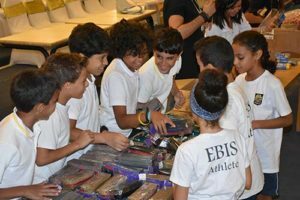 On September 22nd, EBIS held an out-of-uniform day fundraiser for the first charity initiative of the 2018-2019 school year. Thanks to the generosity of EBIS students, parents, and teachers, we raised over 50,000 LE for Share a Smile, an organization that helps provide services and donations for orphans, disabled people, and underprivileged children. EBIS student council partnered with Share a Smile to help them reach their goal of providing 5,000 backpacks to orphans and children in need. The money raised by our school was used to purchase more than 400 backpacks, giving 400 students a happier and more prepared start to the school year ahead. 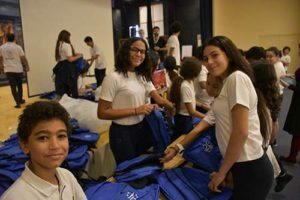 The student council’s first project of the school year was the assembly of all 400 book bags, which were filled with pens and pencils, erasers, rulers, and copy books. 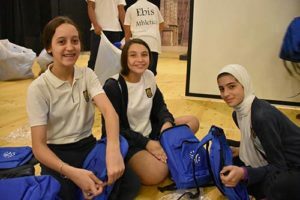 On Thursday, September 27th, the newly elected EBIS student council gathered in the school auditorium to prepare all of the bags. The students worked together seamlessly for nearly two hours, creating an assembly line to properly prepare each book bag with all of the necessary school supplies. EBIS student council enjoyed working with Share a Smile CEOs and learning more about their charity initiatives and experiences volunteering. The students look forward to planning and carrying out additional school-wide charity initiatives throughout the 2018-2019 school year, and hope to continue making a positive impact in society by giving back to those in need.